Free Download All My Movies 8.9 - Manage your movie collection, quick and easy. 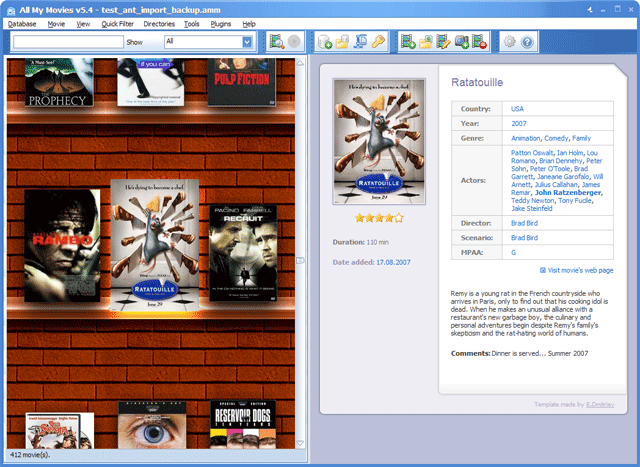 All My Movies is a great tool to organize your movie collection and create a customized movie database of your own. It will save you a lot of manual work by downloading movie information from online movie databases. A smart program will remember not only information about the movies such as title, director, year of release, actors, genre, description, but will remind you the type of storage media (VHS, DVD, AVI file, etc. ),your impressions about the movie or who borrowed it and when. Movie collection management made easy! And it supports your language. The movie catalog is very easy to use. If you want to add a new movie to your database, click the Add button and type the title of the movie, select the movie database you want to use (currently over 14 source databases are supported) and all the information about the movie (director, scenario, year, country, genres, rating, actors) will be retrieved from the specified online database and stored in the All My Movies database. Or you can use the DVD/Blu-ray barcode to search for the movie information on the internet. The cataloged movies will be displayed as a list of movies. You can click on any movie from the list to see the movie details and add more information, if necessary. You can set personal rating, select the movie genre and tick the Wish list and Seen flags. In the Additional tab, you can enter some inventory information about the movie from your collection, such as duration, full size, subtitles, etc. In the Media tab you can specify location of the movie in your house or the path to the movie file. Do not forget to add screenshots of your favorite scenes. If your movie collection is of a considerable size, the movie manager provides you with a number of ways to find movies: instant search to find a movie quickly by name; search through filtering all movie records by various criteria: genre, year, country, media location, etc., search by sorting; advanced search. Download this movie collection manager now! All My Movies 8.9 - Catalogue, organize, sort and filter your movie collection with All My Movies.